The 2018 Melbourne Magic Festival has now vanished for another year – the wands have been packed away, along with the magic suitcases and top hats. I’m always sad to see the festival go because for me, each Melbourne Magic Festival is like an ‘all you can eat” buffet of magic for two solid weeks. Each festival brings the chance to see magic I’ve never seen before, to make new friends and to share magical moments with my friends (that we often reference / reminisce about long after the shows have run). One of my own ‘post festival’ traditions is that after all the reviews have been written, I compile a ‘top list of shows’. These are the shows that have presented (in my opinion) the most amazing, unforgettable or incredible pieces of magic. The shows that have impressed me and that have really gone that ‘extra mile’ – either in presentation or magical effects or by blowing away my expectations. Each year I’ve compiled this list, the amount of shows on the list have changed- sometimes it’s 5 shows, sometimes it’s 10. This year it is 8 shows! Please enjoy this year’s list below, and congratulations to all those who made the list. “That Tingling Sensation” performed by Lucy Darling (Carisa Hendrix): By far the most enchanting magical character I’ve ever had the pleasure of meeting. She sets the bar so high in her magical abilities but I also love her dialogue and how sweetly she treats her fans. There are many reasons why I specifically go and see her show twice each year, but one of the reasons is the semi improvised nature of her shows. If you haven’t had the pleasure of experiencing a Lucy Darling show then you simply must. “Personal” performed by Vincent Kuo: Rarely has a magic show had such an effect on me that this one has. Moving stories and beautiful, sublime magic. The only magic show that has made me have a good cry afterwards. Amazing how magic can generate such raw emotions. “Woody Aragon is a Bald Faced Liar” performed by Woody Aragon: World class card magic presented in a fun, engaging way. I know a show is great if I’m leaning in and am on the edge of my seat to watch the miracles unfold in front of my eyes. A show that engaged all my senses and I loved it. 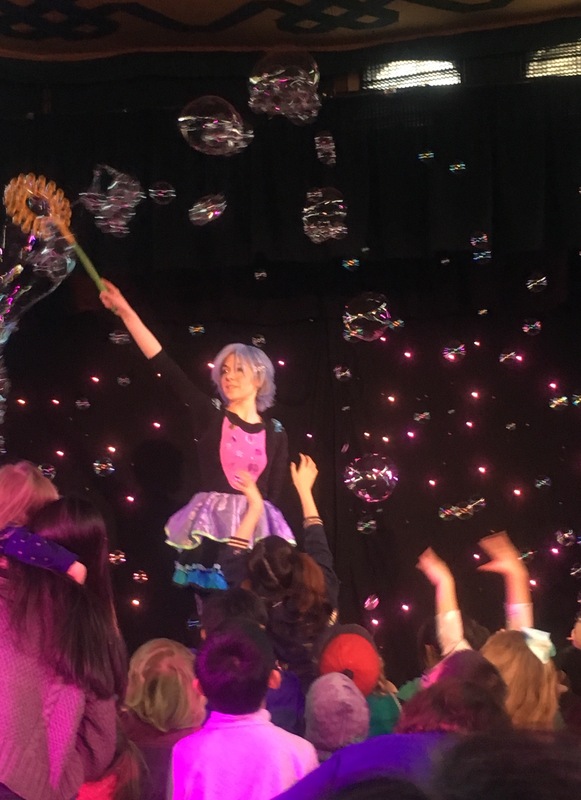 “DeeDee Darling’s Bubble Magic Show” performed by DeeDee Darling (Carisa Hendrix): The sweetest children’s performer with a thoroughly delightful and surprising show. She’s impressive and irresistible. This show was loads of fun and featured plenty of bubbles, magic, dancing and laughs. DeeDee is THE BEST! “The Art of Magic & Illusion” performed by The Showmen (Justin Williams and Sam Hume): The show that blew away all my expectations! The Showmen took classics of magic and reimagined them in the most amazing, dangerous and thrilling ways. They certainly know how to harness adrenaline and get their audience’s pulse racing. This show made me excited for magic and reminded me how excited magic shows made me when I first saw magic. The Showmen are definitely ones to watch / keep your eyes on! “Schrodinger’s Wizard” performed by Mr Marmalade: undoubtedly the most whimsical magic show in this year’s festival but also a show that held many surprises. It was well thought out and put together from a debut festival performer. I have no doubt that Mr Marmalade left everyone feeling enchanted and wanting to see more. “The Magic, Comedy and Something Ellis Hour” performed by Tim Ellis (+ special guests): I feel this show deserves a place in my top shows list because I received a lot of enjoyment from the shows I saw. I loved the concept of this show, how easy it was to enjoy with my friends and the lighthearted nature of the show. It was the perfect mix of magic I’d seen before as well as guests’ special magic that I’d never seen. I enjoyed that the show matched the audience of the evening – some nights the show had a more careful progression, and at other times it felt like a crazy game show with bizarre contestants. It was often the perfect show to see at the end of a night out. Having been to 10 Melbourne Magic Festivals so far, one of my long standing traditions is to always attend the very last show of the festival – the ‘Best of the Fest’. A great credit to show host Nicholas J Johnson is that for the final show of the festival he pull out all the stops to provide a smorgasbord of magicians to entertain the audience in the tight one hour show time. Some magicians end up with literally only a minute with which to entertain the audience, which is quite a feat in itself! Obviously, listing out all the magicians here would be quite a task (and make for a dry review) so I’ll just mention a few highlights, but let me mention up front that there is a reason this show sometimes sells out a week before it runs – it really is that awesome. If you like to see lots of different magic – this show is for you, if you want to see short and sharp magic – this show is for you, if you’re the kind of person who’d like to see a good chunk of the festival performers all in the one show….I could go on! Personal highlights for me during the show were David Chandler’s whimsical children’s magic (also clearly delighting adults too); mentalist Caleb Street involving the entire front row for a mind blowing prediction – which was also impressive from a logistics point of view; and Carisa Hendrix (performer of many, many talents) showing the audience her ‘sideshow’ side by ramming a massive (needle shaped) lobotomy tool up a nostril. I was so thrilled to have that unfold before my eyes, it was AH-MAZING! The wonderful Ghetto Shaman (Adam Axford) returned with some amazing word magic, and we were all treated to a visit by the Dandyman (Daniel Oldaker) with some offbeat comedy (which is what he does best). The best highlight for me, however, was the return of the ‘Best of the Magic Fest’ cult favourite Gary the Magician. 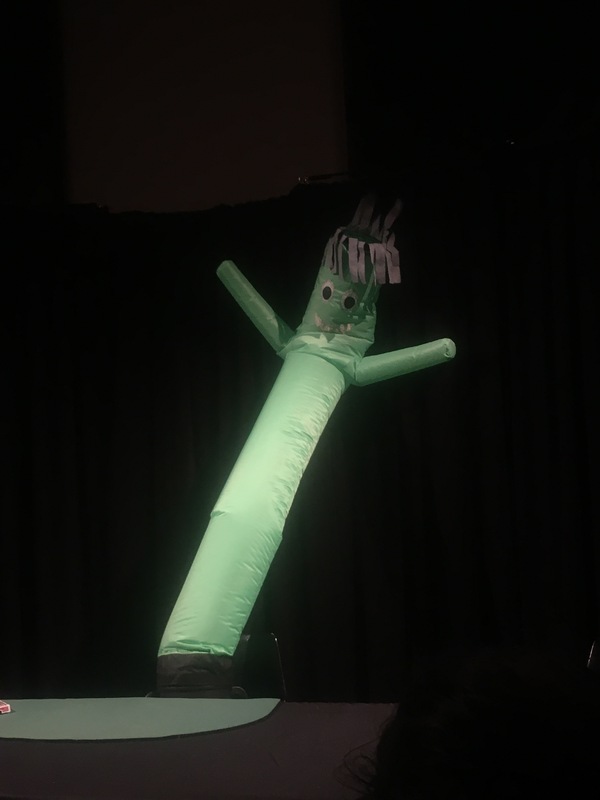 Gary’s a natural performer, with a wide smile, enthusiastic arms and a perhaps ‘inflated’ personality. Gary is pictured within this review in all his green splendour. In previous years there were sad rumours of Gary’s retirement / untimely demise which made me very sad. When Nicholas J Johnson announced that Gary the Magician would be taking to the stage, I’m pretty sure I cheered the loudest…before crying with laughter so much during Gary’s magic routine that I was practically crying into my partner’s hoodie mid way through the routine. Gary the Magician is so special and iconic that I urge anyone who has the chance to attend a show by him to do so. He is literally ‘limited edition’ and his retirement / demise rumours resurface each year so who knows which year will mark his last visit. The final “Best of the Magic Fest” is the perfect show to ‘bookend’ any trip to the Melbourne Magic Festival. It is such a delightful, energetic celebration of magic that I’m distracted enough to forget that it’s the last show of the festival (and that the festival ends after the show is done). VERDICT: unmissable, and a runaway hit of the festival. No one forgets their experience at the last ‘Best of the Magic Fest’ so I can’t recommend this show enough. Make sure you book it in your calendar next year! Continuing the magical adventures on the last evening of the Melbourne Magic Festival my partner, some close friends and I we were all keen to discover what well travelled magician Davide Kaufmann (originally hailing from Italy) had in store for us in his show ‘Favole’. Davide explained that his show title means ‘fable’ with aspects of fairytales included. Davide has a very engaging nature on stage – lots of wide arm movements and big facial expressions – which were well utilised during a storytelling based show. Fables and stories were regularly referenced during this show, and Davide used a screen to display pictures to explain the fables he was referring to. This helped give the audience context to the stories that were being explored via magic on stage. Each piece of magic performed by Davide was well matched to a fable or story. I especially enjoyed a piece of magic involving tarot cards (which can be used in of themselves to tell stories). Sitting in the front row, there were many moments during this show where we were all transfixed. One of these points was during a ‘Russian Roulette’ routine. Davide used various props during the routine to decrease tension and include comedy, which transformed what can be a tense routine to watch into a fun moment. Another moment where I was transfixed was during one of Davide’s personal stories of how he came to be in Australia and came to love this country. At the end of the show, Davide included links / his contact details in case anyone wanted to know more about the fables explored during the magic show – which was a nice touch. Overall, a very enjoyable show where the storytelling points were as strong as the magic. VERDICT: A charming story based magic show with whimsical elements alongside some great magic. Very enjoyable – easy to watch and share with friends. On the final day of the Melbourne Magic Festival, I sat in a theatre bustling with a crowd of families and children to watch Felix The Magician’s debut show at the festival. Titled “Where are you Tony?”, the storyline was that Tony (Felix’ magical rabbit) was running late to the show and it was up to Felix to find him. The wildly colourful assortment of props on stage hinted at the comedy and magical delights that were about to unfold. Felix himself is an affable magician. He engaged his audience well, welcoming everyone to the show and waving at the large crowd of children sitting closest to the stage. During the show itself, I particularly enjoyed the looks of surprise on Felix’ face when things comically went wrong or when he couldn’t find Tony. I very much enjoyed all the physical comedy / slapstick aspects of the show. Felix’ show also included plenty of magic – some classic magic, for sure, but also some clever pieces of magic that I’d never seen before. Some of Felix’ magic even included household / everyday objects which I found impressive.There were gasps of surprise and delight from audience members when objects disappeared or when Tony the rabbit wasn’t in the place we thought he’d be. There were also loads of laughs (as expected) during this show, especially in relation to a particular scene towards the end of the show. Felix’ show included lots of fun audience participation, which was especially enjoyed by the children in the audience. Over the course of the show, Felix did a great job of progressing the story via magical effects until the goal was reached. Felix did well to keep his young audience members ‘on track’ with the story too, as well as addressing / acknowledging their concerns – like when children insisted that Tony the rabbit was “over there! !” (while feverishly pointing to a specific box). Those moments were very entertaining for the adults in the audience, but it also brought joy to many to see children get so involved with the storyline. Overall I was impressed by this show – it certainly didn’t ‘feel’ like a debut festival show for Felix, he was so natural with all the magic and the show flowed well. It was a delight to see a ‘fresh’ family magic show with a fun storyline. VERDICT: A delightful family magic show, suited to young children and families. Many laughs and magic moments were shared by all. Felix is a friendly host and talented magician, so I wouldn’t hesitate to recommend Felix’ show should he reappear at the festival in future. The premise of this show was simple: host and very well know Melbourne magic identity / icon Tim Ellis would perform magic (which was often lighthearted), and each night the show would feature a different special guest magician. The shows were executed well and I enjoyed the format of this show so much, that I ended up seeing two evenings of the show – each time with a different assortment of friends attending with me. In terms of the ‘special guests’, Tim pulled out all the stops to feature magicians with varied strengths / special routines. During one evening, superstar Dom Chambers performed the ‘appearing beers’ routine that he’d previously performed for Penn & Teller on their “Fool Us” tv show. It was truly a fantastic routine, and I was so pleased to see it in real life before my very eyes! During another evening (that took a very ‘adults only’ turn) the audience was thrilled by some comedy magic by none other than the enchanting Lucy Darling. I won’t spoil exactly what happened here, however at one point Lucy instigated a sword duel between two audience members which literally had members of the audience cackling with laughter. After this year’s shows I honestly don’t think there is anything that the enchanting Lucy Darling can’t do. She’s just incredible. This is one show I especially enjoyed sharing with my friends, and we all animatedly referenced / recounted our favourite parts of the show to each other long after the shows had passed. It’s a great show to watch to introduce someone to magic, or if you’re keen on comedy as much as you are magic as I felt there was an equal mix of both in each show that I saw. I enjoyed the format of this show, so I hope it returns for another season in the future. VERDICT: A fun, entertaining and surprising show each time. Great for people newer to magic shows right through to the diehard fans. Definitely worth including in your future show schedule. The show is best suited to adults. 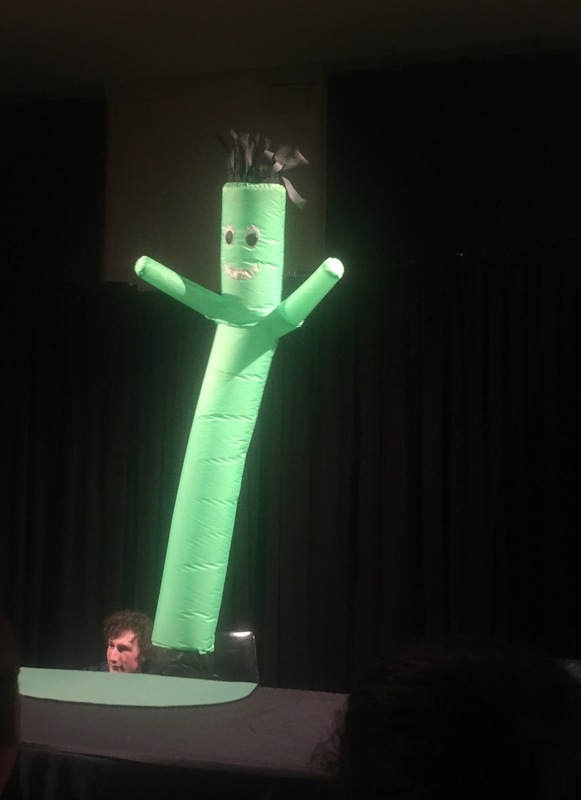 One aspect I enjoy about the Melbourne Magic Festival is the chance to see some kid’s shows / shows for families that I would otherwise miss during my ‘9 to 5 life’. 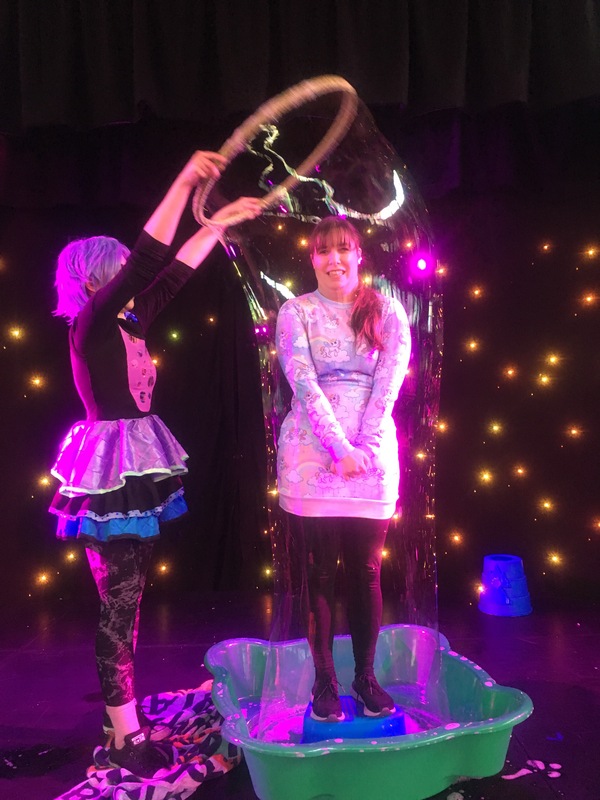 On the final Friday of the festival, I took a whole day off to watch magic but it is no secret that I actually booked a day off work to watch DeeDee Darling’s Bubble Magic Show. DeeDee Darling is another magical character performed by the incredibly talented Carisa Hendrix (of Lucy Darling fame) so I knew this show was going to be loads of fun. Who could resist a show about bubbles?! I must say that this show was full of surprises from start to finish! DeeDee herself is unmissable, with her big eyes, sweet smile and blue hair. 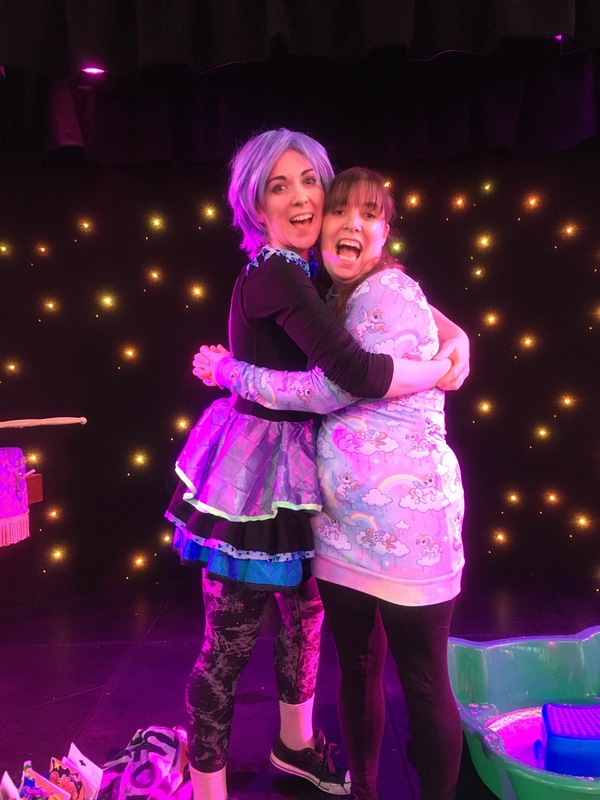 Dressed in a fun outfit with a cool mix of complementing colours, I expected to see DeeDee bound onto the stage with loads of energy – however instead she sat on the steps of the stage, waving and making faces at the children in the audience until everyone had realised she was there. She knew what the audience was there to see – bubbles and loads of them. Many different varieties of bubbles and bubble formations were shown, along with a couple of cool science props. Throughout the show, DeeDee displayed her mastery of bubbles and we even learned some of the science of bubbles along the way. Some clever pieces of magic carried along the bubble theme was included, which were well received by the crowd. Another surprising aspect of this show was the level of audience interaction and participation. 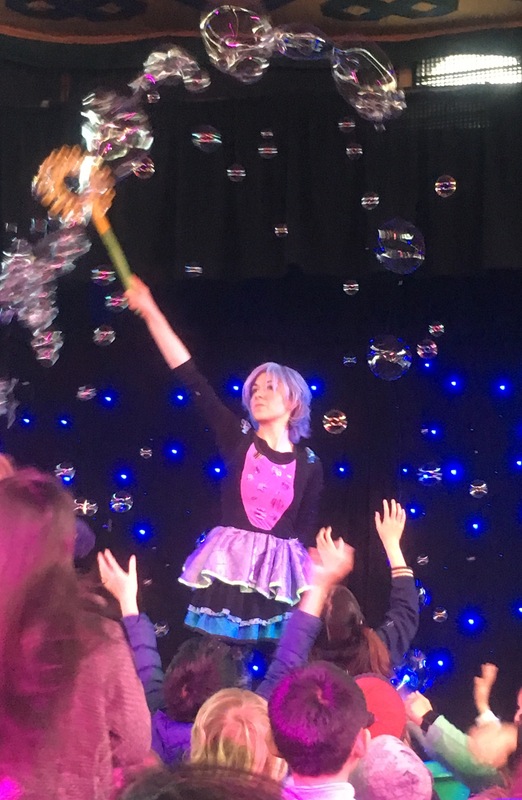 Sure being a kid’s show, many children had the chance to go up on stage and assist DeeDee with her wonderful bubble magic however DeeDee also has a (very catchy) theme song that everyone was encouraged to learn the words of and dance along to. I had expected this to be a sedate bubble show that I could quietly watch from my seat at the back of the theatre, but no – all of a sudden I was learning the words to DeeDee’s theme song and freestyle dancing like the rest of the crowd! DeeDee Darling’s catchy theme tune will have you humming long after the show ends. The excitement for bubbles and DeeDee herself continued long after the finale of the show. In a world where people (and children) are often hurried out of shows and from one activity to the next, it was nice to see DeeDee’s show take a different pace as she hung around after the show to greet her new fans and the audience could take their time to enjoy a few more moments of bubble magic before they left the theatre. VERDICT: DeeDee is the instigator of the ‘victory lap’ and a sparkling character that you’ll quickly warm to. If DeeDee Darling visits your town, don’t delay to catch your tickets – you won’t want to miss out on all the fun! This special performance as part of the 2018 Melbourne Magic Festival was hosted at The Laneway Theatre – a hidden magic theatre, away from the main magic hub. I escorted a close friend to the theatre as we had both seen Carisa Hendrix’ character performance as Lucy Darling the week prior, but we were both thoroughly curious and intrigued. We wanted to see more and were willing to keep travelling down that proverbial ‘rabbit hole’! Away from her many characters (Lucy Darling and DeeDee Darling to name a couple) Carisa Hendrix is a fascinating person and performer in her own right – while retaining a refreshing ‘down to earth’ demeanour. Given this was a ‘one night only’ magic show in an intimate theatre with 32 seats I knew we were all in for a special night of magic and stories. Opening the magic show with a vocal ’round up’ of all her characters thrilled me, and captured the attention of everyone in the audience. Pleasingly, everyone in the audience had seen at least one of Carisa’s characters, with a good portion of the audience having seen more than one character (Lucy and DeeDee). It was a delight to watch Carisa perform her own style of magic along with some ‘sideshow’ elements, away from the trappings of different voices, elaborate costumes and extensive sets. The stories that Carisa chose alongside her pieces of magic were well selected to evoke strong emotions along with a sprinkling of mischievousness. Some of the stories were tied to Carisa’s many (again, fascinating!) disciplines – like art / design, working as a magician’s assistant, her varied skills and awards / achievements – and her life adventures. Some people believe that with strong characters, come people who prefer to hide behind those characters. I don’t personally believe this is true in Carisa’s case, however I do think this performance showed a lot of bravery. With many magicians putting on a ‘different face’ to their audience vs their ‘off stage’ face and persona, I felt that with this show we saw the genuine, true Carisa. The show that was delivered to the audience was an exact match to the name of the show, and the audience enjoyed the show so much. As the show progressed, Carisa’s stories evoked stronger emotions. With a stirring finale, I felt that Carisa had the audience in the palm of her hand – as she usually does – but not by any character other than herself. Concluding with a massive round of applause for a performer who consistently gives each show her all, Carisa stayed back to personally thank each audience member for attending which was a sweet touch. Demonstrating so much with a show like this, I think Carisa will have many fans for life. When I heard about the magic show “Ghetto Shaman” and met magician Adam Axford, I have to admit I did not know what to think or what to expect. Visually, Adam looked like he had visited us directly from a music festival however he was the perfect person to take his audience on a journey which focused on the wizardry of words along with some impactful pieces of magic. Adam Axford himself is an extremely relaxed performer, which I found refreshing. I could feel the intimate audience relax just that little bit more given Adam’s ‘chilled out’ demeanour, and at most points in the show it felt like we were all on a special journey together which was lovely. Regularly dispersed between pieces of magic was Adam’s talent with wordsmithing / poetry. Reading this, it may not be apparent how well matched the word wizardry and magic sorcery was weaved together to make a great show but rest assured that is what occurred. Contemporary poetry may not be everyone’s “cup of tea” however the audience in the room that night were eagerly lapping up everything Adam had to offer (myself included). The magical effects of the evening included card magic and some delightfully mystifying predictions. I felt that each piece of magic had been carefully chosen for the show or to sit between particular stories or poetry choices. Technology was also well utilised to create some magic which I thought was clever (given the focus of modern society on all things technology). There were a few aspects of this show that I LOVED. I loved how the show pushed the boundaries of what the audiences perceives as “magic” and then references the magic of the universe. I loved that the show was presented in a distinct, refreshing way – even after watching 500 magic shows in total, I’ve never seen a magic show presented quite like this one! I loved how committed Adam was to what he was saying, presenting and the fact that his audience would leave the show having learnt something or be on the way to further learning / reading resources. Through one impactful effect in particular (which happened to be one of my favourites) Adam managed to create a magical moment, while engaging each member of the audience via a magical “reading list” AND further establishing how deep he runs with his own reading / research. I can scarcely recall a piece of magic that I have seen in recent years that has achieved all of these outcomes in the same space of time. I left this show feeling at peace and so relaxed. It was such a refreshing show to see in a fast paced life and I wish I could see the show again. It was extra kind of Adam to stay back after the show to discuss further reading and topics of the universe with his new friends. VERDICT: A “must watch” if you’re looking for a magic show with a difference! Be prepared to be surprised and to expand your mind (reading topics!). *disclaimer: I attended this show as a guest of the performer. Visiting the Melbourne Magic Festival from Adelaide, well known magician Matt Tarrant is an expert marketer and clearly has a strong following of fans. You could barely go anywhere in the festival without seeing Matt’s face on his flyers and posters, and the show I attended was heaving with audience members – every seat in the large theatre was filled. Everything about this show was cleverly planned – from the music playlist the audience listened to pre show, to the items on stage and the large screen set up with social media handles and contact details. Matt is clearly aware of his modern audience’s tastes and tendencies, yet he opened the show with a brief monologue of how modern audiences annoy / frustrate him – as he “knows” (believes?) they will all rush online after magic shows to research how every trick is done. Given the wide range of (family) audience members this could be true for a portion of the audience, however I’d have preferred if he’d taken the time to conduct a brief “audience poll” – like I have seen magicians do in the past – as the results may surprise him. Personally, I can guarantee you that I wouldn’t have seen 500 magic shows across my lifetime if I insisted on researching how everything was done, however that’s just me! Making assumptions about how your audience ‘treats’ magic or processes magic shows can lead to a disconnect between performer and audience. Matt commenced the show with a pleasing piece of card magic along with a nice story of how he became interested in magic as a child. Fun pieces of card magic also reappeared later in the show, much to the delight of the audience who gasped with delight at the final reveal. Mentalism featured heavily in Matt’s show, and I liked how Matt used stories and video clips when explaining what he wanted to achieve with his magic. Audience volunteers were used at regular intervals during Matt’s performance (especially during the mentalism segments) and for the most part, audience members were very keen to help Matt out on stage. 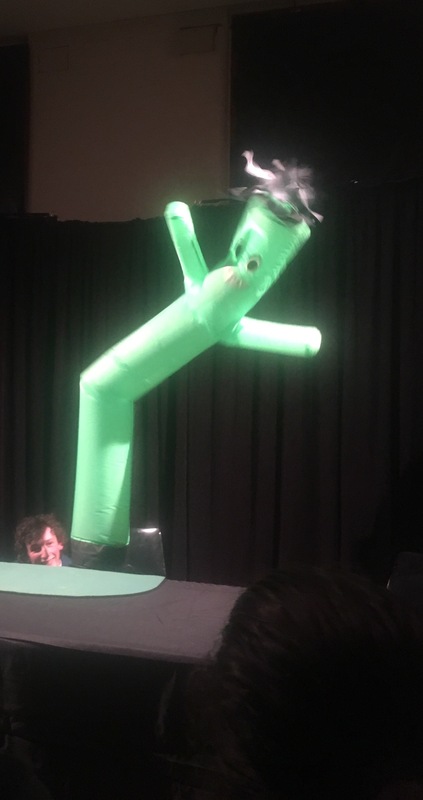 These parts of the show were exciting, as a plush toy was enthusiastically tossed around large sections of the audience to select volunteers – which also added to the fun atmosphere of the show. While the mentalism segments of the show were generally fun, I found some pieces to be less convincing than others. I don’t know if this is due to the setup of the particular piece or the choice of audience volunteer. There was also a ‘Russian Roulette’ magic piece that was largely hyped via video, with a volunteer from the audience who clearly did not wish to be onstage or help out. It was a shame that another (keen!) audience member couldn’t be selected for that piece as it made for tense, uncomfortable viewing. Lucky Matt was able to finish with a sweet, lighthearted piece of magic as a finale. The finale was delightful and I’m glad that a child volunteer was chosen from the audience as the children in Matt’s audience had been dying to help him out all night. Overall it was an entertaining magic show, and I’m grateful that I had the chance to see it. I felt that the show included a good selection of Matt’s ‘favourite’ effects, however the show seemed restricted to cards and mentalism (which I did not expect). It would be good to see more pieces of magic from Matt that aren’t restricted to those two categories. VERDICT: An entertaining show, and I guess a ‘safe bet’ if you don’t see a lot of magic (but don’t mind helping on stage). I felt this show was aimed more at adults rather than children (as mentalism can bore children, especially so when only adult helpers are used). Be aware that Matt uses a lot of audience volunteers so if you’re not comfortable with that, then this isn’t the show for you. *disclaimer: I attended the show as a guest.